We are a group of Chinese students born in the 1980s and 1990s and now studying abroad. Twenty-six years ago on June 4th, young students, in life’s prime with innocent love for their country just as we are today, died under the gun of the People’s Liberation Army in Beijing’s streets. This part of history has since been so carefully edited and shielded away that many of us today know very little about it. Currently outside China, we have been able to access photos, videos and news, and listen to the accounts of survivors, unfettered. We feel the aftershocks of this tragedy across the span of a quarter century. The more we know, the more we feel we have a grave responsibility on our shoulders. We are writing you this open letter, fellow college students inside China, to share the truth with you and to expose crimes that have been perpetrated up to this day in connection with the Tian’anmen Massacre in 1989. Around 9:30 on the night of June 3rd, 1989, gun shots tore the tense streets of Beijing. On that day, troops enforcing martial law opened fire on students and residents who had protested peacefully for nearly two months. The demonstrations were initiated by college students but people from all walks of life participated, numbering over 300,000 at the peak. The center area of the peaceful sit-in was in Tian’anmen Square. It was a time when the nation had been encouraged by the relatively freer and more open political atmosphere throughout the 1980s, people had had trust in the Communist Party and held expectations of a government that called itself “the people’s government.” At a time when economic crisis threatened and corruption worsened, students and residents wanted to have a dialogue with the nation’s leaders to make the country a better place. Never for a moment did the peaceful demonstrators dream that a planned massacre was awaiting them. 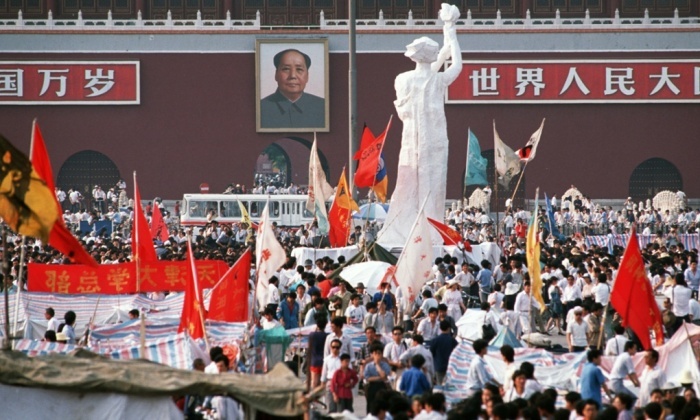 Per orders from Deng Xiaping, Li Peng and other Chinese leaders, the PLA forced its way toward Tian’anmen Square to clear out the student occupiers. They drove tanks with machine guns mounted on top, and they shouted “I will not attack if I am not attacked” while opening fire on civilians. On its route at Muxidi (木樨地), several hundreds of unarmed civilians fell in streaming blood shouting “Fascists!”, “Murderers!” Among them was Yan Wen (严文), a 23-year-old mathematics student at Peking University, shot dead by bullets to his thigh. He was there with a camera to record history. Another was the 17-year-old high school student Jiang Jielian (蒋捷连) who had been determined to go to the Square to be with older brothers and older sisters there. 19-year-old Wang Nan (王楠) was yet another who fell, and the bullet-holed helmet he wore is now on display in Hong Kong. The 21-year-old Wu Xiangdong (吴向东)had with him a death notice that read, “For democracy and freedom, for the fate of the nation, every ordinary person has a responsibility.” According to witness accounts, the troops that had entered the Square beat clusters of students with batons even though the two sides had already agreed on the student withdrawal; at Liubukou (六部口), tanks chased, and ran over, a column of students who had left the Square and were walking back to their campuses. Fang Zheng, a senior at Beijing Sports University, lost his legs to speeding tank tracks. There had been unconfirmed reports that pockets of protesters were encircled and executed en mass. Around June 4th, massacres also occurred in Chendu, Sichuan province, and elsewhere. In mid and late June that year, the government issued three versions of a “report on quashing the riots.” It portrays the civilians as a rioting mob and presents precise numbers of dead and wounded among the troops and the loss of vehicles, but at the same time, it is vague and contradictory on the number of civilian deaths. Questions remain: why were the weaponized troops unable to defend themselves [if there was indeed a riot]? If they were unable to defend themselves, how did they break through the blockade of hundreds and thousands of civilians? What caused the people of the nation to gather in the streets of the capital to prevent the troops from moving forward? The report claims that the civilian deaths were few. If so, why repeatedly alter the number of death and never publish an accurate count? If the report is to be believed, the civilians attacked the soldiers first. If so, why was the first death among soldiers not reported until more than three hours after the troops opened fire and blood bathed Muxidi? During the protest, police once confided to Zhou Fengsuo (周锋锁), one of the student leaders in the Square, that “Beijing’s public order has never been so good” as the last two months of “disruption” and “riot.” According to the memoir of Hou Dejian (侯德健)，[the Taiwanese poplar singer] who stayed until the last moment in the Square, students insisted on non-violent principles even at the last moment of forced withdrawal and threw away any possessions that could be used to attack. Meanwhile, the atrocities of the troops were recorded in photos of bleeding wounded and stacked bodies, videos of shooting civilians, hospitals’ body identification notices and body counts, shocking reportage by Wu Xiaoyong （吴晓镛）of Central People’s Radio Broadcast, not to mention the persistent questioning of Tiananmen Mothers over the last twenty-six years. If all of these are lies as the government claims they are, what is making these parents, now white-headed and frail, seek justice for so many years while sacrificing a normal life? Last year on Capitol Hill in Washington, DC, this writer met with some of the survivors of the massacre. The MC read aloud a partial list of the dead, and people proceeded in a long line to pay respects with flowers. From hundreds to thousands, there have been different numbers and we might never know exactly how many died that year in Beijing. But people witnessed many shocking crimes, and perhaps many more occurred at unknown corners without witnesses. Some witnesses have grown old, others have passed away, and still others dare not speak even though they now live safely overseas. The Chinese government has never dared to publicize the exact number of deaths, and in dealing with a historical event of such magnitude, it first portrayed it, solemnly, as an “anti-revolutionary riot,” and then over the time it downplayed it as a “political ripple,” systematically erasing it from the collective memory of a generation. June 4th has become a “sensitive” time each year, an unmentionable date. Such an enforced taboo is a reverse proof that the atrocities against civilians in 1989 are something the Communist Party would rather keep mum about, although this is a Party with a murderous history of civil war, anti-rightist movements, and the Cultural Revolution. A classmate of this writer believes that the events from twenty-six years ago are too far back, today’s China is getting better and better, and he lives a very happy life. As I walked on the Avenue of Eternal Peace two years ago, I saw no trace of blood or bullets but skyscrapers and the bustling of people and cars. We live in prosperity, but what kind of prosperity it is – our imagination is constantly challenged by the astonishing scale of high and low ranking officials, the marriage of power and money that the students opposed twenty-six years ago has become the prevalent model of the state economy. Xi Jinping’s regime waves the banner of anti-corruption, but ordinary people are thrown in jail as trouble makers for holding signs asking officials to disclose their assets. The clans of Deng Xiaoping and Li Peng, whose hands were stained with the blood of students, have become filthy rich. We are shocked to discover that we are governed by officials whose family members live abroad. In other words, we are ruled by a bunch of foreigners, and China is merely the goose that lays golden eggs for them. Twenty-six years ago, students wanted freedom of the press; and twenty-six years later, all media are still controlled by the Party’s Propaganda Department, and journalists and lawyers are being put in jail for invented crimes. Gao Yu’s crime was leaking state secrets, or the ruling party’s latest ideological guidelines. Some of my friends are of the opinion that those who draw the Party’s ire do so because they are famous and conspicuous. We, on the other hand, are mere ordinary people who don’t care about politics. But are ordinary people safe from harm? Think about Xia Junfeng (夏俊峰), Xu Chunhe (徐纯合), and the daughter of Tang Hui (唐慧). No one is safe in a dictatorial system. When North Korean soldiers crossed the border and killed innocent Chinese, and when Burmese bombers bombed Chinese territory, this government merely “protested.” Come to think about it, the PLA’s only military victory in the last thirty years was the bloodbath in Beijing’s streets on June 4th, 1989! This is fragile and distorted prosperity. Stability maintenance expenses are as big as the military budget; the Great Fire Wall is being stacked ever higher. They all indicate that, at any moment, truth can come to broad daylight, and the prosperity can collapse. A voice inside China that says, the Tian’anmen Massacre was unfortunate, but the Chinese Communist Party has learned a lesson, and we don’t want to obsess over it. But the suppression has never stopped: the truth about June 4th is still covered up, the dead still do not have closure, some survivors have served long prison terms, Tian’anmen Mothers are prevented by security police from paying visits to their children’s burial sites. Last year, a group of scholars was detained for having a home seminar to remember that day, and a female student at the Beijing International Studies University was disappeared for proposing a technology to spread the truth about the Tian’anmen Movement. This is the killer’s regime. The gun fire on June 4th shot dead their legitimacy, and what they have accomplished since June 4th is not important. We do not ask the CCP to redress the events of that spring as killers are not the ones we turn to to clear the names of the dead, but killers must be tried. We do not forget, nor forgive, until justice is done and the on-going persecution is halted. This writer and the signers of this letter know very well that there are consequences in writing and signing this letter. But this is our responsibility, and we hope fellow students inside China know this part of history, and reexamine the violence and atrocities since the Communist Party’s beginning in 1921. From Jingangshan (井冈山, one of CCP’s early bases in Jiangxi province) to Tian’anmen Square, millions of innocent people have died, and we must remember them, but also reflect on wave after wave of sufferings. We have no right to dictate your minds or ask you to do something, but we do have a dream: we dream that, in a future not too far from now, each one of us can live in a country free of fear where history is restored and justice realized. This is the China Dream we have – we, a group of Chinese students studying abroad. Chinese students in the west call for transparency over Tiananmen Square, Guardian, May 25, 2015. Letter From Overseas Chinese Breaks Silence on Tiananmen, The New York Times, June 4, 2015.